“Alaniya’s book is one of the best captivating books that I’ve read in years. Alaniya brings the wisdom and insights gleamed from her High-self and her life experiences, into every chapter. … As a spiritual author myself, who has also glimpsed the wisdom of the higher realms of reality, her words and energy brings emotional joy of a higher reality that we too can create here on planet earth. 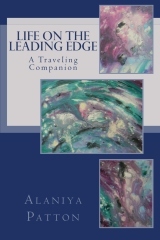 I highly recommend Alaniya’s book “Life on the Leading Edge” to any reader who believes that they have read it all, and still wants to learn more on how to create a new age of peace, joy, and love on our physical playground we call planet earth. … “ Larry Vorwerk, author of “The Bartholomew Effect: Awakening to Oneness”. Very often, we may feel like these lonesome warriors on our spiritual paths. Sure, we got the books, we learned to meditate, we know so much already, yet there are days when things just don’t come easy, or so it seems. There are days when doubt creeps in. I am pretty certain that anyone who focuses on their spiritual development encounters doubt at one point or another. It does not matter what we doubt, who we doubt or if we know that we doubt. The sense of uncertainty and the faltering energetic pattern that I could best describe as wavering and collapsing onto itself, seems to be at the core of the pattern that we call “doubt”. Undoubtedly (pun intended) that state is one of misalignment. Doubt tells us one thing and one thing only. It only tells us that we have slipped a bit farther away from our align­ment with source and that is that. The big hype about doubt is just that – it is nothing more than a wee call from our source to find the emotion that hangs on the other end of the polarity stick. In my book that would be trust. Instantly, everything looked possible again and I had to laugh so hard. Life was simple – again. Over time, I have found so many simple solutions to the complicated knotted up situations I had created, that this one was just too good not to share with others. Since then, this one sentence has quite possibly helped a fair amount of my friends through their tough doubting spots. Perhaps it was just the laughter, which had catapulted me out of my self-inflicted mess. Be it as it may, I was able to find better thoughts, and I was able to see some light at the end of my self-created tunnel. I found that only universal forces could come up with such a simple logic that works and almost instantly, I found myself again aligned and trusting. Trust that all is as it is supposed to be and is unfolding in absolute perfection, has become a mantra and I nurse it. I take care of trust as if it were a tender plant. I don’t take trust for granted. I feel appreciation for my ability to trust again and again in the source of all that is. It is not just trust that unfolds in this approach, but one can also find the energies of grace and mercy in such an experience. To me, appreciation, trust, grace, and mercy are shades close to the energy of unconditional love, which is the fabric of everything that is.